LONG BEACH — Dustin Durant won the 2012 ISAF Grade 3 Butler Cup-Long Beach Stop match race regatta Oct. 7, hosted by Long Beach Yacht Club as part of the 2012-2013 California Dreamin’ Series. At the end of the event’s first day, Oct. 6, Durant sent a message to the other five skippers that he was the one to beat by posting five first-place finishes and no losses. In Sunday’s semifinals, Durant stumbled for a moment in a loss to San Francisco area match racer Bruce Stone, but he won the first two out-of-three races over Carson Reynolds (Balboa Yacht Club) to ensure his name would be engraved on the Butler Cup perpetual trophy as the 2012 winner. Durant is no stranger to winning in the Catalina 37s used in Long Beach YC’s match race events, having won the 2012 Grade 2 Ficker Cup and then competing in the 2012 Grade 1 Congressional Cup. Durant’s crew included Alex “A.J.” Jacobs, Shane Young, Phil Toth, Max Moosmann and Jack Bazz. “This was a good warm-up for the higher-graded events in the future,” Durant said. Second place went to Carson Reynolds, of Balboa YC, who brought some of his J/105 Lipton Cup teammates to help him out in the regatta. “As long as I made it into the finals, I’m good,” Reynolds said. “Those guys (on Durant’s team) are very quick. I’d like to win, but they were quick,” he said, smiling. Bruce Stone, of St. Francis Yacht Club, took third-place honors; with David Storrs, of Pequot Yacht Club, finishing fourth. Dave Hood, of Long Beach YC, was fifth; and Bill Durant, also of Long Beach YC (and father of Dustin Durant), was sixth. The next stop for the 2012-2013 California Dreamin’ Series will be at San Diego Yacht Club, Jan. 12-13, 2013. 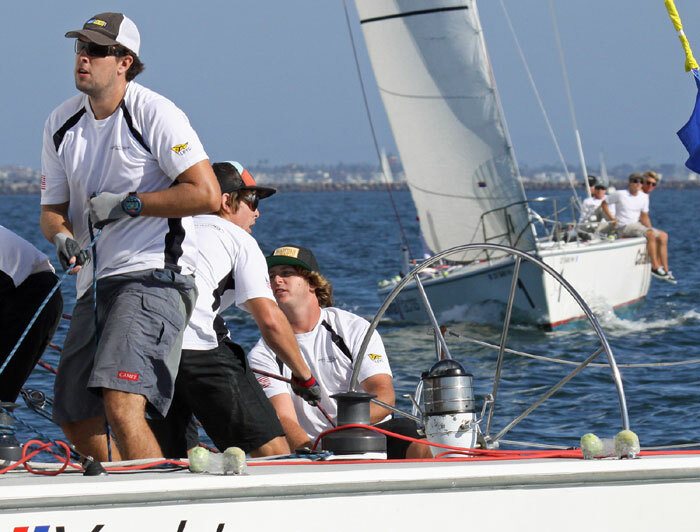 After that, the teams will be back in Long Beach for the third and final stop at the 2013 Butler Cup-Long Beach Stop, March 16-17. The event is named for Frank Butler, founder of Catalina Yachts, who in 1990 designed, built and donated the 11 Catalina 37s used for all of the ISAF match races held at Long Beach YC. These same boats are also used throughout the year for fleet race events and are available for charter through Long Beach Sailing Foundation.